Planet Earth needs a self-help book, and this is it The future is happening to us far faster than we thought it would and this book explains why Fifty years after Marshall McLuhan's ground breaking book on the influence of technology on culture The Medium is the Massage, Shumon Basar, Douglas Coupland and Hans Ulrich Obrist extend the analysis to today, touring the world that's redefined by the Internet, decoding and explaining what they call the 'extreme present'. 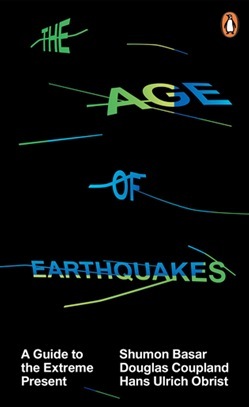 The Age of Earthquakes is a quick-fire paperback, harnessing the images, language and perceptions of our unfurling digital lives. The authors invent a glossary of new words to describe how we are truly feeling today; and 'mindsource' images and illustrations from over 30 contemporary artists. Wayne Daly's striking graphic design imports the surreal, juxtaposed, mashed mannerisms of screen to page. It's like a culturally prescient, all-knowing email to the reader: possibly the best email they will ever read. Welcome to The Age of Earthquakes, a paper portrait of Now, where the Internet hasn't just changed the structure of our brains these past few years, it's also changing the structure of the planet. This is a new history of the world that fits perfectly in your back pocket.